Box Text: An Epic, Gut-busting Adventure! When Bowser inhales Mario and Luigi, the bros must power up their nemesis from the inside to save the Mushroom Kingdom from Fawful in the most hilarious game yet of the celebrated RPG series! 02-09-2014 pacpix Box Text An Epic, Gut-busting Adventure! 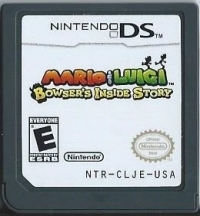 When Bowser inhales Mario and Luigi, the bros must power up their nemesis from the inside to save the Mushroom Kingdom from Fawful in the most hilarious game yet of the celebrated RPG series! 12-09-2012 artikskarab Box Text An Epic, Gut-busting Adventure! 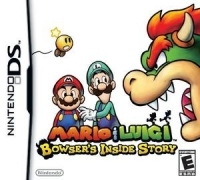 When Bowser inhales Mario and Luigi, the bros must power up their nemesis from the inside to save the Mushroom Kingdom from Fawful in the most hilarious game yet of the celebrated RPG series! This is a list of VGCollect users who have Mario & Luigi: Bowser's Inside Story in their Collection. This is a list of VGCollect users who have Mario & Luigi: Bowser's Inside Story in their Sell List. This is a list of VGCollect users who have Mario & Luigi: Bowser's Inside Story in their Wish List.